Two weeks ago, Davil Tran, a 22-year-old from Brooklyn, founded Vetememes. 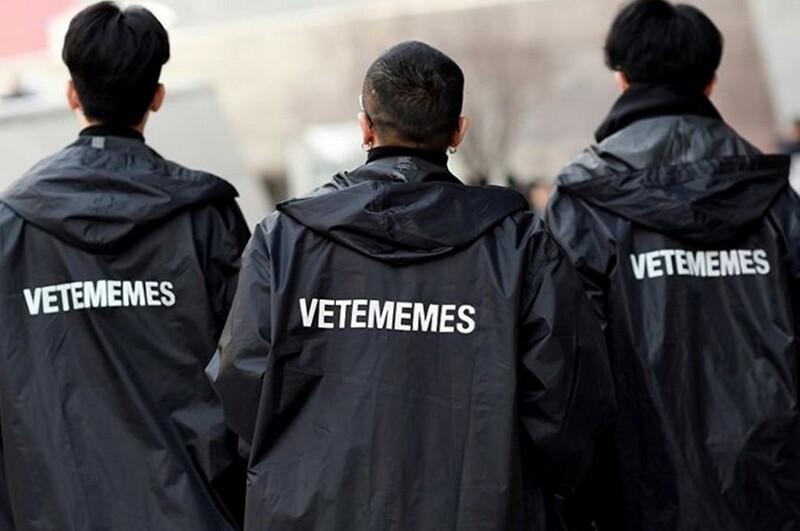 With its name a tongue-in-cheek nod to existing label Vetements, his fledgling company has already built a virtual reputation for its single product offering – a logo-flipped copy of the buzzed-about brand’s signature (sold out) logo raincoat. At £40, it’s a fraction of the price you can expect to pay to get your hands on one of the originals – although initially retailing for £100, a glance at re-sell site Grailed shows that a secondhand jacket will set you back anything from £200-£350. While on the surface, Tran’s creation seems to be parody in the vein of the Comme des Fuckdown beanie hats and Homies t-shirts that made the rounds a couple of years ago, subverting the logos of high fashion houses, the significance of this relatively simple item goes further than simple graphic mimicry. It’s symbolic of the way that, in an industry currently obsessed by social media and dizzied by its own pace, trends are being born and proliferated faster than ever before. Bought online, modelled on Instagram and then ironically reworked, garments like the original Vetements raincoat aren't just becoming popular, they're going viral. As Tran told WGSN: “I wanted to start with the raincoat because of how ‘meme’ it is. You can’t look at any street style right now without seeing it.” The coat's relatively low price tag (compared to one of the brand’s £7000 sequin dresses) has a lot to do with this – it's affordable, and therefore accessible. Like their DHL t-shirt, Champion sweatshirts and Titanic hoodie (along with other pieces that have been seen on everyone from Selena Gomez to Kanye West) Vetements have proven themselves to be particularly adept at creating “viral” garments, items that have the irony and popularity of memes, with as much life online as off. Reactions to their pieces range from outrage at their price tags to praise at their power to troll fashion's fad-driven nature – after all, when you think about it, a £200 courier company t-shirt is pretty funny. As with memes, their graphic designs are satirical and instantly recognisable, taking on new life on social media – like when DHL Express CEO Ken Allen modelled the unofficial t-shirt and the company posted a ‘who wore it best’ on Twitter. Part of the success of these garments is that they tap into the same strategy that streetwear brands have been relying on for decades – where relatively basic, easy to wear, signature pieces like hoodies or t-shirts are stamped with the kind of graphics that mark the wearer out as “in the know” – part of an exclusive, aspirational and yet still relatively underground club. This way, Vetements has done what high-end fashion seldom achieves: it’s generated hype, the kind of frenzied, brand-driven desire that has helped establish names like Supreme and Palace. 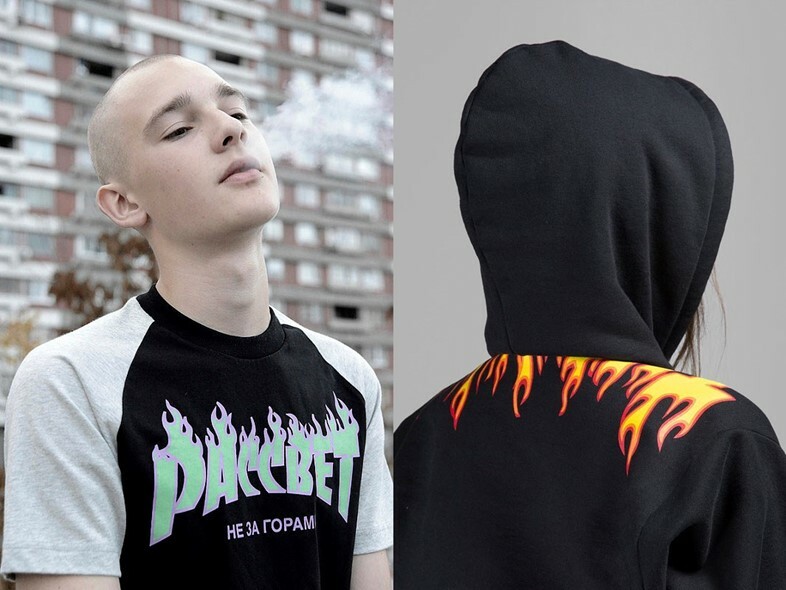 You might look to the flaming Thrasher t-shirt as an example of another fashion meme – since being played with by Gosha Rubchinskiy several years ago, its flames have been remixed by Vetements and the original t-shirt (far more affordable and accessible than archive Gosha or sold out Vetements) has seen a surge in popularity to the point that its total ubiquity has rendered it passé. Of course, fashion items experiencing this kind of boom and bust popularity is nothing new – brands like Fendi, Marc Jacobs and Chloé established a steady stream of ‘it bags’ through the 90s and 2000s, their reputations having been made by appearing in glossy magazines on the arms of celebrity women like Kate Moss or Alexa Chung (who even had one named after her by Mulberry). Still, these it-items were relatively exclusive, and prices were high, meaning less wealthy consumers had to resort to high street copies to get the style. Unlike the Vetememes raincoat or DHL t-shirt, these mimicries weren't self aware, and ended up damaging the prestige of the original item rather than boosting it – who wants to wear a designer bag when everyone on the street has a fake? Now, you can buy an actual DHL t-shirt from eBay and revel in the supremely weird po-mo irony of wearing the original that inspired the copy. So what else has changed since the it bag era? For starters, the lines between streetwear and high fashion have been continually eroded, not only by Vetements, who occupy a unique space between the two worlds, but brands like the Comme des Garçons-backed Rubchinskiy, whose Cyrillic-stamped tees have garnered a similar cult cache; or Virgil Abloh’s Off-White, which now shows at Paris Fashion Week. Then there’s the rise of social media, which has given an already fast paced industry a relentless new urgency, providing both the outlet and playground for viral fashion. Names like Ian Connor, Luka Sabbat, and even Kendall Jenner bridge the gap between the worlds of elitist fashion and popular culture, making the brands they wear more accessible than ever before. Instagram is a space where labels like Vetements can become cult in just a few seasons, trends can be born in a matter of hours, and clothes can sell out in minutes. While once being transformed into meme was a mark of derision, now it’s a signifier of cultural relevance, to be encouraged rather than feared. Drake’s “Hotline Bling” video is a good example – it relies on social media, on public interaction and reinterpretation, for its success. Rather than the meme being an unintended side effect, the video seems to have been created to facilitate virality: Drake dad dancing was made to be GIF’d. Likewise, a designer DHL t-shirt provides fertile ground for the internet to sink its teeth into, and only adds to the brand’s prestige. Granted, it hasn’t been transformed into YouTube parodies, but Insta celebs like Sarah Snyder have posted pictures wearing the t-shirt while posing with the company’s trucks, people have taken to creating their own artistic interpretations of it, and according to Twitter, some have actually gone into DHL stores hoping to purchase one. Viral fashion is a natural extension of an industry spinning faster by the day – but what’s the consequence of it? It seems a shame that focusing on a few Insta-friendly items like graphic t-shirts might reduce entire collections to a couple of meme-able, hype-friendly garments. It could be argued that these pieces are the equivalent of fashion ‘clickbait’ – more accessible but not necessarily as indebted to craft or concept as more complex designs. While it’s unlikely that brands like Vetements will lose any real ground to ironic counterfeiters, in an industry that changes its tastes from day to day, who can say whether this month’s it-item will be next month’s Thrasher t-shirt? Maybe eager shoppers, placing orders for Vetememes raincoats, will find their new purchases to be outmoded by the time they arrive on their doorsteps a few weeks down the line.